Nearly everyone has struggled with that question or a variation on it at some point. More often than not, even if it is not spoken out loud, there is a God question behind it. If there is a God of love and justice in charge, how come life is so unfair? If God cares about goodness and fairness, why would God not make sure that everyone gets what they deserve in this world? Why? Tonight’s first Bible reading came from the book of Job, and the book of Job is all about this question. But – spoiler alert – it doesn’t neatly solve it. 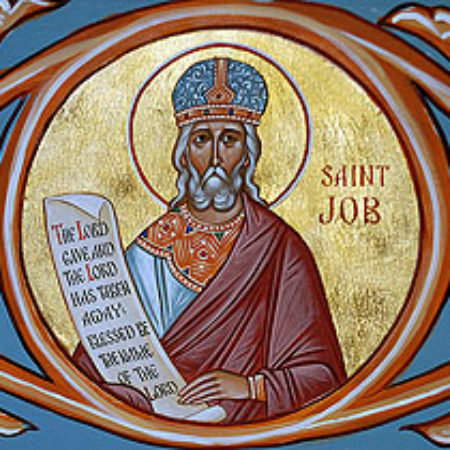 We’ve had readings from the book of Job for the last four weeks, and you may have noticed that the first and last ones had a very different flavour to the two in the middle. The book of Job is kind of like a sandwich. If you just read the first and last chapters, it reads like a neat little short story. It begins with a conversation between God and the satan about a good man called Job. The satan accuses Job of only being loyal to God because he’s so blessed. With God’s permission, the satan destroys Job’s family, his possessions and his health. Job is devastated, but he continues to honour God. And eventually, in the part we heard tonight, God rewards him by blessing the remainder of his life even more richly than the first part. If that was all there was to the book of Job, its message would be clear and simple. Not necessarily satisfying, but clear and simple. The normal pattern of the world is that everyone gets what they deserve. But sometimes God allows good people to suffer as a test. If they pass the test, they will be rewarded again, and live happily ever after. But that is not all there is to the book of Job. Another forty chapters have been sandwiched between the opening scene and the happily ever after. The book now presents a much more complex picture. Its answers are not so simple. They may not even finally be answers. In the forty chapters in the middle, Job argues with God and with four of his friends about the injustice of what is happening to him. He may not curse God, as the satan had predicted, but he certainly accuses God of treating him with undeserved cruelty and failing to govern the world with justice. It is a strange sandwich. The style of the filling is very different from the two ends. So different that it is easy to imagine that some editor has taken two different stories and sandwiched one into the other. But whether or not that’s true, we now read them together. Much the meaning now comes out of the tension created by the sandwiching. Interestingly, if I might digress for a moment, we got the back end of a similar sandwich in tonight’s gospel reading. Mark is the master sandwich maker among the biblical authors. He creates little sandwich stories all the time (e.g. Mark 3:20-35; 5:21-43; 11:12-25), but he also uses a giant club sandwich structure for a large section in the middle of his gospel. There is some teaching about faithfulness and inclusiveness sandwiched between two stories about welcoming small children, sandwiched between two stories about the disciples arguing over who was the greatest, sandwiched in turn between two stories about Jesus healing blind men, the second of which we heard tonight. The overall effect is that all the material framed between the two healings stories comes to illustrate Jesus’s attempts to open the eyes of the disciples. Mark makes a lot of use of an image from the prophet Isaiah (6:9-10) about God’s people having eyes that can’t see and ears that can’t hear. Jesus tries hard to open our eyes so that we might see the world through the loving eyes of God, but healing the literally blind proves easier. So blind Bartimaeus, at the end of the sandwich, with his eyes opened, follows Jesus on the way, a picture of what Jesus hopes for for all of us. So, to segue back to Job, perhaps this sandwich framework in the book of Job is similarly trying to open our eyes, to enlighten us in a place where it often seems there is only darkness, amidst the suffering of the world. Perhaps, but it is not as simple or clear-cut as in Mark. At first glance there is a similarity. Both sandwiches end with a kind of happy ever after picture – Job restored to health and wealth, and Bartimaeus healed and joyously following Jesus. But the happy ever after picture in Job is different. It somehow disturbs us. I think that the author or editor probably intended it to. Somehow it is way too happy ever after. It feels exaggerated. And it feels way to neat and simple. Anybody who has lived a bit of life, or even just read the forty chapters in the middle, knows that even if this story really did end up in an enormous happy ever after, that’s the exception, not the rule. Life doesn’t consistently work out that way, and the anguished questions of the forty chapters are neither answered nor swept aside by this one oh-so-happy ending. Anyone who has ever lost a loved one knows that even if Job’s new children do grow up to be the most wonderful young men and beautiful young women in all the land, as the story describes, that can still never answer Job’s aching cry for his previous children who died tragically and unfairly. If anything, the author seems to amplify the nagging questions of the happy ending. God pays Job back double for everything he lost, even to the point of giving him double the normal three score and ten lifespan. Paying back double is what the biblical law prescribes as the restitution that a criminal must pay to his victim. That’s not letting God off the hook. And despite a final speech in which God says that Job’s friends were wrong, was it not one of Job’s friends who had said that if Job admitted his sin and repented, God would doubly bless the remainder of his life? (Job 8:7) The author seems to be planting explosives into this happy ending. The same final speech had God saying that Job had spoken rightly, but in the sandwich filling Job has repeatedly accused God of being callous and cruel and failing to govern the world with justice. More explosives. This apparently happy ending is starting to look subversive and disturbing. Perhaps it is a deliberate irony, obviously too simple and too happy because it is actually wanting to provoke us into protesting. Perhaps it is trying to stir us up to reject the simplistic closure, and inviting us to keep asking the hard questions and refusing to let anyone fob them off with cheap promises of happy endings and neat answers. It confronts us with some of our own over-simple expectations. It pricks at our desires for a neat answer, a comprehensive explanation that makes sense of everything. It shines a light on our desire for a religion that will give an answer for everything and so relieve us of having to live with uncertainties and unanswered questions. It exposes our attraction to easy-answer theologies, and our almost fatal desire to ignore the persistent failure of such systems. It is rightly said that to every complex problem there is a simple answer, and it’s wrong. It is not that the book of Job offers no answers. It is that it doesn’t offer one all-conclusive answer. It doesn’t resolve all our questions, especially our theoretical questions about how to make sense of it all in a neat system. Instead it offers us multiple answers that don’t quite hold together. The simple framing story first offers one kind of answer. The voice of Job and voices of his friends in the sandwich filling offer two more perspectives, two more kinds of answers. The voice of God speaking from a whirlwind in the later chapters offers another kind of answer. And just when we think it is all building to a satisfying resolution, the final chapter returns to an obviously over-simple story full of obvious landmines to frustrate us. It’s easy to feel angry at the book. It seems to promise serious answers, but then delivers multiple answers that contradict each other. In the forty chapters, it makes us work really hard at unravelling complex ethical dilemmas, but then when we expect to be rewarded for our efforts, it skips off into the distance without rewarding us with a resolution. It’s easy to feel angry with it. And perhaps you’ll go home angry with this sermon for the same reason. And perhaps a lot of people felt angry with Jesus when he answered serious questions with parables that similarly teased and challenged and shed new light on the question, but refused to zoom in on one clearcut definitive answer. Perhaps that is the invitation in the end, the invitation of both the book of Job and Jesus himself. We are being invited into a deep and wondrous life that is rich in relationships and complexities. We are being invited into a life where the search for answers and the search for meaning are always communal activities. They are always a community dialogue. Each one brings a different perspective and no one has all the answers, but we are closer and richer if we properly hear from one another. Sure, sometimes that will feel frustrating and unsatisfying, but consider the alternative for a moment. Has there ever been a system of clearcut one-size-fits-all answers that didn’t end up becoming a repressive totalitarian nightmare? Churches that insist on one definite answer for everything end up as abusive cults that demand unquestioning conformity. Doubts and questions are mercilessly crushed and those who cannot submit to the approved answers are expelled and demonised. But Jesus the parable teller and Job the relentless questioner invite us to come with them into a courageous community that welcomes the faith-filled and the doubt-filled equally. It welcomes those who believe easily, and those who because of horrific abuse or trauma cannot believe anymore. It welcomes those with this answer and those with that answer and those with no answer and those with only more agonising questions, and asks us all to respect one another and listen to one another and love one another and continue the journey into truth and life and hope together. Together too with Bartimaeus, we follow the parable teller on the way, the way that leads to another monstrous injustice, a suffering death on the cross. And while the resurrection is a happy ever after to end all happy ever afters, the risen Christ still bears fatal wounds, and the cry of “My God, why have you forsaken me?” still hangs in the air with no clearcut answer. My friend’s questions about her father remain unanswered too, but given the choice between a perfect explanation and a community that would surround her and her father with love and care as they face the journey ahead, I think she’d choose the second. But, answers or no answers, no one needs to forgo the questions. The wounded hands of the risen one beckon us forward, neither answering all our questions nor condemning them and asking us to turn our backs on them, but inviting us to bring them with us as we join the dance of life that is the culture of God, where the final word is not iron-fisted answers but all-inclusive love and mercy and hope.